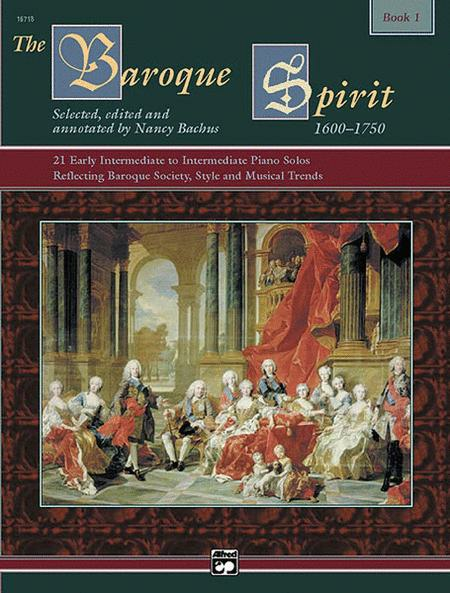 21 Early Intermediate to Intermediate Piano Solos Reflecting Baroque Society, Style and Musical Trends. By perf. Daniel Glover. Edited by Nancy Bachus. Graded Standard Repertoire; Masterworks; Piano Collection. The Spirit Series. Baroque; Masterwork. Book; CD. 64 pages. Alfred Music #00-16718. Published by Alfred Music (AP.16718). Feel the Baroque period come alive with The Baroque Spirit as you are given an overall view of that era through an integrated arts approach. Repertoire from both familiar and lesser-known composers are included along with commentary about the composers' lives and social changes in the era. Repertoire in Book 1 ranges from the early-intermediate through intermediate levels. This book has a clear and very informative text. I own several introductions to baroque keyboard music but most of these pieces I had never seen before. They are well chosen and great fun to play. 15 of 31 people found this review helpful. 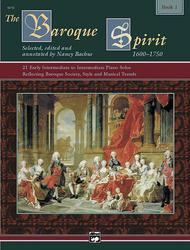 We are very satisfied with the purchase of the book & CD of the Baroque Spirit. Thank you for your service. 15 of 34 people found this review helpful.